NEXT T0 CITY HALL, ACROSS FROM INTERSECTION WITH HUDSON STREET. HANDICA PPED ACCESSIBLE; LIBERTY BUS LINES 1, 2, 4, 5, 7, 8, 25 & 30. MUNICIPAL PARKING LOCATED AT THE CITY HALL MUNICIPAL PARKING GARAGE BEHIND THE BUILDING. THE OFFICE IS LOCATED 2 BLOCKS EAST OF THE METRO NORTH RAIL ROAD STATION WHICH ALSO HAS A STOP FOR AMTRAK. The Yonkers Social Security office is located in Yonkers 10701. The following page includes information for this location like the office phone number, hours of operation and driving directions. If you have any interests or comments about your retirement benefits or are interested in making an appointment, call the following Yonkers Social Security office. 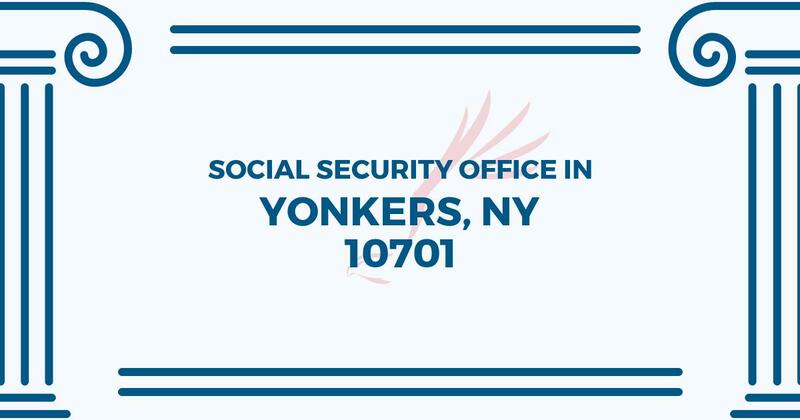 The Yonkers Social Security office is located at Yonkers 10701. The New York SSA controls a variety of federally run programs like retirement, SSI, Medicare and disability benefits. The following page contains useful contact information for this location such as the Social Security office phone number, hours of operation, and driving directions. If you have any concerns or requests about your retirement Social Security benefits or interested in arranging an appointment, call the following Yonkers Social Security office.